In the absurdist play Who’s Afraid of Virginia Woolf?, the feuding couple, Martha and George, skirts the thin line between illusion and reality in their marriage. One eventful evening, Martha invited a young couple to their place for some drinks on a whim. The hosts—probably one of the worst pair in the history of theater—then pummel one other verbally in front of their guests, trading increasingly vindictive insults as the couple squirmed at the spectacle. The couple had no child at all. Such stories, which feature characters in ambiguous circumstances, exemplify absurdist fiction, with many carrying an undercurrent of frustration from the characters’ inability to find their purpose in life. Samuel Beckett’s Waiting for Godot had two men waiting for the eponymous character to show up while they do nothing of significance. And in Franz Kafka’s The Metamorphosis, the protagonist woke up one morning to discover that he had turned into some sort of roach-like bug. Yet, his immediate concern was how he could get to work in such a state. Similarly, The Franz Kafka Videogame hopes to tell an absurdist tale inspired by the works of…well, Franz Kafka. In this point-and-click puzzle game, a man, simply named K., was offered a job he cannot refuse. Embarking on a distant voyage against his will, players are presented with a dazzling array of logical puzzles that they must solve. By stripping away unnecessary features like inventory systems or boss battles, The Franz Kafka Videogame instead relies on its puzzles to bolster its narrative. However, I wasn’t ready for the frustrations that belies its beautifully hand-drawn animations. They stem not from any form of existential anxiety nor the bizarre circumstances K. found himself in, but the gratuitous puzzles that presented themselves every time I make any semblance of progress into the game. The Franz Kafka Videogame is chock full of puzzles so laborious, they threaten to detract from the story—one that is already difficult to follow. Some others are almost illogical and impossible to solve. While the timed hint system implicitly encourages players to try their hand at puzzle-solving before throwing in the towel, this causes the story’s pacing to grind to a halt, as I haphazardly clicked about the screen just so that I can get the puzzles over and done with. This is not to say that the plot was unnecessarily convoluted; it is merely that like its most tedious puzzles, following it becomes incredibly exhausting. Absurdist fiction is a study on the inscrutability of human motivation. Why are we so keen, for instance, to find the meaning of life, when it’s clear that the truth can never be known? 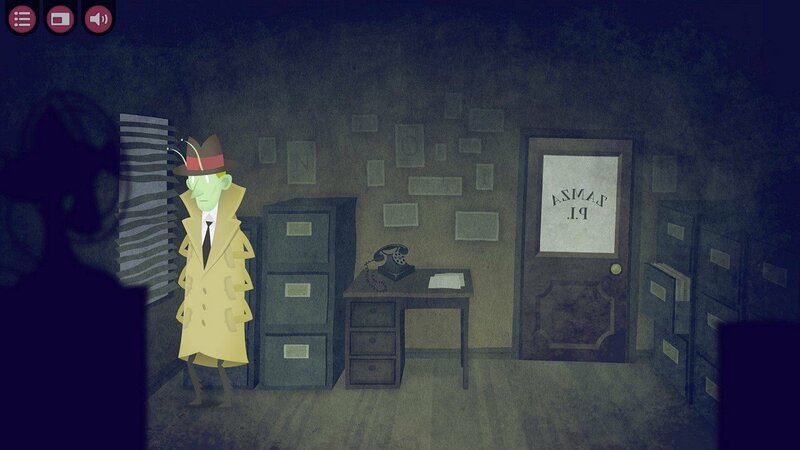 The Franz Kafka Videogame tries to use Kafkaesque worlds as a backdrop for K’s extraordinary and even purposeless circumstances, and as a lens to examine the admittedly absurd nature of human behaviour. To its credit, it almost succeeds—only to be subverted by tiresome puzzles that drag me out of the experience. And when the game abruptly ends, I found myself sighing with relief, because I have no more puzzles to solve.